first off i haven't thanked you for the love of my turkey! so glad you like him as much as katie and i do (ahem and my boys have mentioned that it's kind of cool too). i'll be doing a "look at you guys go" again so make sure you keep the pictures coming either through links or email or the flicker group! my project: the "wheat pillows"
so many of you were right as to which one was my project! 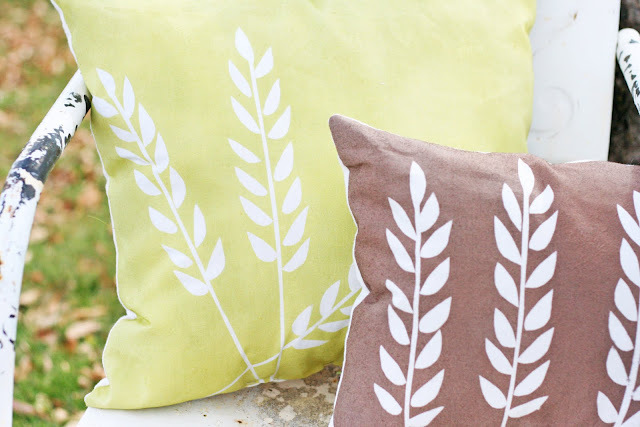 the "wheat pillows" evolved when i started to think i wanted something modern, easy to make, and something i would put in my house. and well, voila! the wheat pillows were born. i'll have a tutorial up on how to make them later on. most likely later on friday. that way you can all have some time with the winning tutorial for the last challenge. congrats to dana for winning the first round! can you guess which one is mine this time around? it might not be as blatant as last time...or maybe i'm wrong and you can still figure it out. whatever the case, go and vote for your favorite craft...and we'll see next monday if i continue on to the next round of sytyc!!! HAHA, I totally voted for you... I love those pillows!! SO cute. yup. i voted for you too :) super cute pillows....they just screamed "vanessa". Oh, I was thinking this was you and it was totally my favorite too! Love them. Cannot wait to see a tutorial. I am off to see what is out there this week. What a fun thing you are part of! oh i totally voted for you. i can spot your stuff ANYWHERE. I knew the pillows were yours because of the blue pillow with them, lol. Almost positive I guessed this week's also. This was my favorite from last week and I was hoping they were yours since I voted for them! I love those! 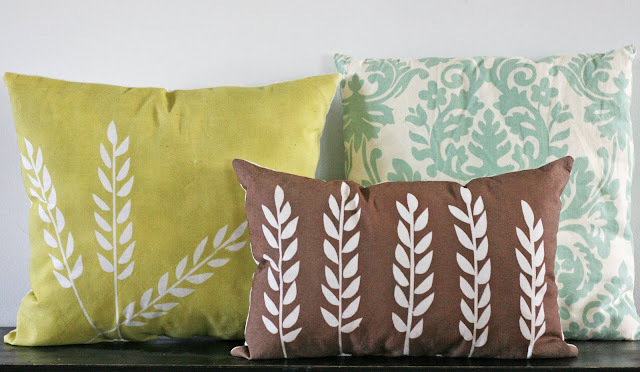 I have been planning to do something similar with white craft paint on a color, and then the colored paint on white pillows with the same design. Those look great! I voted for your pillows. I thought they were the best! well if you didn't win, at least the adorable dress did. Better luck this week! Off to check it out! I voted for you, too! I can't wait to see the tutorial. I knew those adorable wheat pillows were yours! Of course I voted for the pillows...totally spotted the pillows. I just thought to myself...mmm those are pretty awesome and I covet them already...oh those must be Vanessa's. I will say I most not be the best groupie though, I am having a hard time this go around...it will be interesting to see if I am right...I have narrowed it down to two. So on the turkey...yes this is the world's longest comment...I am planning to make food for my boys for Christmas, oh friend let's both cross our fingers and hope I can pull it off. The homemade kitchen (a masculine one at that since it is for boys) has to get done too...this is when I think, oh I wish I was you then I KNOW I could finish it all...right now I am just praying for a miracle!!!! Ok that was a long way of saying...I LOVED THE TURKEY...oh my poor brain you must need sleep! I think that sweet looking headband is yours. I had voted for the pillows too. It looked a lot like your style. LOVE the wheat pillows... can't wait for the tutorial! i think your is the no sew wreath....if so I hope there is a tutorial. i just know its you! WOW -- I voted for you and didn't realize I was voting for you! Bonus! Love those pillows. They would look perfect in my living room or on the bed!!!! Some of my favorite colors and designs.